In this facility, we can conduct thermal vacuum test of flight instruments by using vacuum chamber. 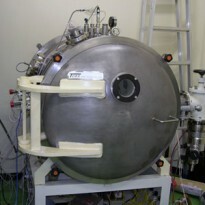 So far, we used this chamber for the development of instruments aboard Japanese Kaguya lunar orbiter. It is also used for instruments which need vacuum environment. There are two vacuum chambers, whose dimensions are, i) 350×350×500[mm](maximum), and ii) 700×700×400[mm](maximum), respectively. Heating /cooling is possible for the chamber (i), but long time cooling is not easy because it does not have liquid-gas generation equipment. Only vacuum test at room temperature is possible with the chamber (ii).